Uneven maturity and green tissue delays harvest. Spraying glyphosate desiccates green foliage & stems. The photograph (below left) shows the uniform dessication of sunflower by the use of glyphosate (Roundup Bioaktiv) applied by helicopter in Hungary (Czepó, 2009a). The photograph (below right) shows complete foliar desiccation of grain maize on the right side 14 days after application of glyphosate (Roundup Bioaktiv) at 0.54kg ae/ ha in 7 0L/ ha applied by helicopter using Reglojet nozzles and including Bandrift Plus at 0.1 % at 34% grain moisture in Hungary, with the untreated visible on the left-hand side. 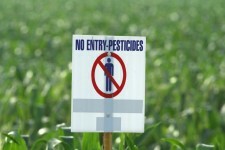 Given that enough Roundup is applied to full-grown plants to completely kill them, much higher quantities of Roundup are obviously being applied than would be required simply to keep away insects (while keeping the plants alive). Similarly, the plants don’t have time to metabolize or otherwise get rid of the Roundup, and there is not time for rains to wash away the Roundup before harvest. Instead, Roundup is dumped on the plants to dry them out, and then they are immediately harvested … with high levels of Roundup still present.